Sailor Moon is a popular anime and manga series during the mid-90s that centers on a young middle-school girl named Tsukino Usagi. 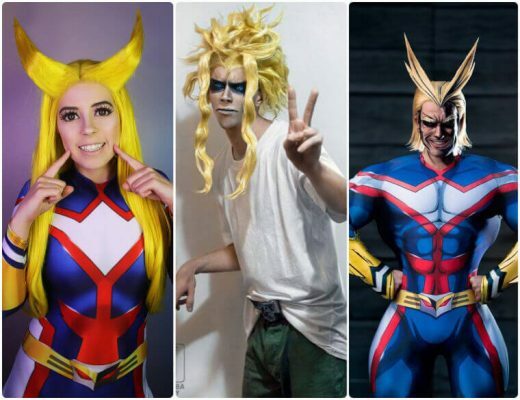 She was living a normal life before discovering that she is a reincarnation of a superhero with the name Sailor Moon. As Sailor Moon, Usagi is also the reincarnation of the superhero’s civilian persona Princess Serenity. Princess Serenity lived in the Moon Kingdom during the Silver Millennium era. She is the daughter of Queen Serenity, who was the ruler of the Silver Millennium and presided over the Earth. When the princess went down to Earth, she met and fell in love with Prince Endymion, Earth’s crown prince. Her guardians and close friends are Sailor Mercury, Sailor Venus, Sailor Mars, and Sailor Jupiter. As the past identity of Usagi, Princess Serenity is also another option to dress up in if you want to cosplay the main character but doesn’t want to dress up like her Sailor Moon persona. 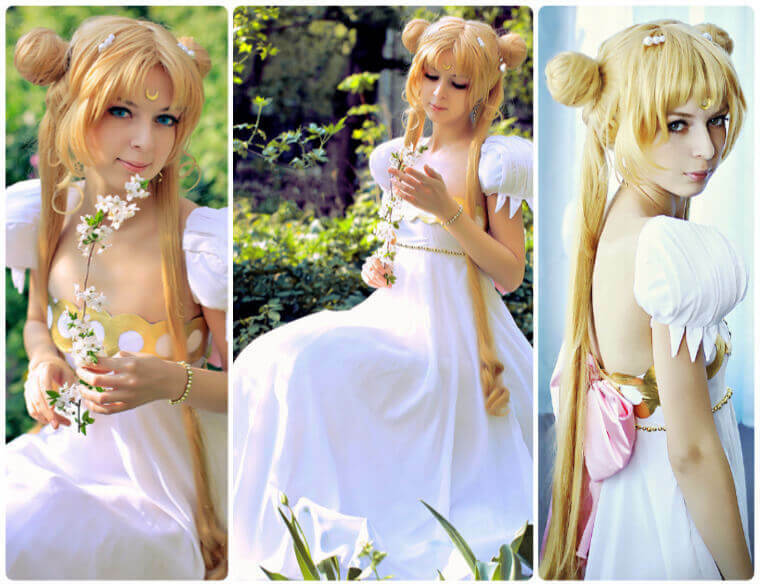 Here it will be a Princess Serenity cosplay guide. Princess Serenity was very fascinated with Earth and wanted to go there. Since she was forbidden to do so, she had to visit the planet secretly. There, she met Prince Endymion, and the two of them fell in love with each other. Usagi Tsukino occasionally takes the form of Princess Serenity when she needs more strength than what Sailor Moon can access. 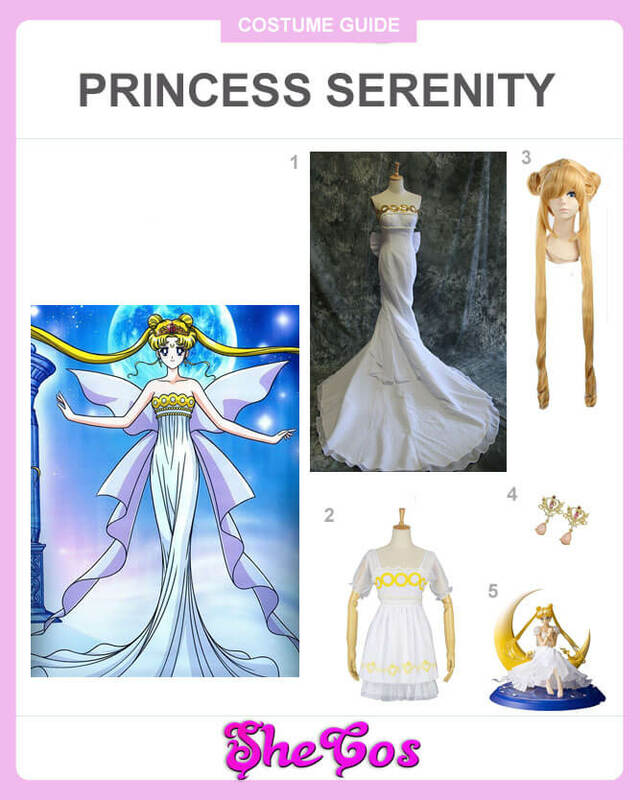 The Princess Serenity cosplay set includes her full costume and a small figure of the character. The whole outfit comes with two dresses, with one being the long white empire silhouette gown that she usually wears. It’s a long white tube gown with golden circles around the top of the dress. The other outfit is the short white empire silhouette dress, which is a short white old-style dress with yellow rings at the chest area. The costume also includes a long blonde wig for Princess Serenity’s hairstyle and gold earrings with pearls. Before she reincarnated as Usagi Tsukino, Princess Serenity has blue eyes, a long silvery white hair, and wears what they call a White Empire Silhouette gown. She lived a charmed and happy life before the Dark Kingdom attacked and caused the downfall of the Moon Kingdom. In the anime, she and Prince Endymion were killed during the attack, but the manga showed that it was only Prince Endymion dead while she committed suicide. She is more powerful than Sailor Moon, which is shown in the series when Usagi would transform into the princess when she needs more strength to defeat the enemy. 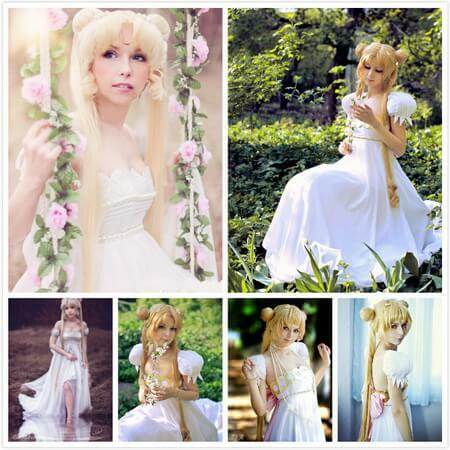 Looking at the Princess Serenity cosplay photos, you won’t see the powers that Princess Serenity possesses since her appearance reflects more her elegance, sophistication, and the aura of being a princess. But make no mistake, she is a compelling character, as the live-action series of Sailor Moon showed she was the one who destroyed the Moon Kingdom after Prince Endymion was dead.